Plup is a smasher from Florida considered to be one of the best Melee players in the world. He is the best Sheik player in the world, a top Fox player, one of the best Samus players in the world along with Duck and HugS, and one of the best Luigi players in the world. He has strong placings in nationals, including 1st at GENESIS 5 and DreamHack Atlanta 2017, 2nd at The Big House 7, 3rd at EVO 2016, 4th at CEO 2016, and 5th at EVO 2017, Smash Summit 2 and Smash Summit 3. He is also the second player in competitive Melee history to take a set off of each of the Five Gods, after defeating Armada at The Big House 7. He is a strong doubles player, frequently teaming with Hungrybox, and more recently teaming with Mew2King, taking 1st at GENESIS 5 doubles. He is currently ranked 2nd on the Central Florida Melee Power Rankings and 4th on the 2018 MPGR. After Apex 2015, Plup switched from Samus to Sheik while still using Samus as an occasional counterpick. 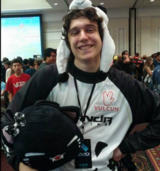 Plup has also demonstrated his competence with other characters, such as Luigi which he used exclusively at CEO Dreamland, defeating Nintendude and Druggedfox and placing 5th, the highest placing a solo Luigi has received at a major. He placed 3rd at CFL Smackdown 72 by playing exclusively Young Link. In 2016, Plup showed early success with Fox, winning Frame One and defeating Wizzrobe, Axe, and Colbol in the process. Plup is also a professional Project M Samus player, with secondaries Meta Knight and Sheik. He took 1st place in CEO 2014 Project M doubles with fellow Florida smasher Wizzrobe. Plup has a positive record against Leffen (8-6). Plup humorously forgot to receive his medal on stage with the other top 8 finishers at EVO 2015. Plup dropped and broke his 1st place trophy at DreamHack Atlanta 2017, which was later replaced. Plup has taken at least 1 set off of each of the members of the 2015 top 6. He first defeated Hungrybox at Advent II, Leffen at Paragon Orlando 2015, Mango at EVO 2015, PPMD at Smash Summit, Mew2King at Battle of the Five Gods, and Armada at The Big House 7. By placing 5th at CEO Dreamland while using only Luigi, Plup became the highest placing Luigi ever at a national Melee tournament, beating Abate's 7th place finish at The Big House 5. Plup is one of the only four non-Gods to win a tournament with two or more Gods attending, doing so at DreamHack Atlanta 2017 over Hungrybox and Mew2King. The others are Jman at Don't Go Down There Jeff, Leffen at B.E.A.S.T 5, and Zain at Shine 2018 respectively. Plup is also the second player to defeat each of the Five Gods in a tournament set at least once (after Leffen). Plup is also the only player that has taken multiple sets off of each of the Gods. ↑ Just joined Panda Gaming!. This page was last edited on April 22, 2019, at 00:06.